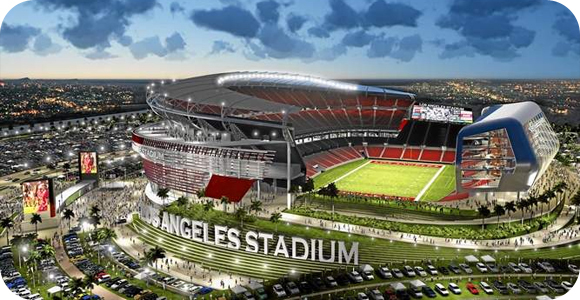 We heard the rumors back in February that Los Angeles would be home to professional football once again. This news just keeps getting better and better, as the Rams, Raiders, and Chargers are making proposals to possibly make L.A. their new home. It is quite funny, seeing as how the St. Louis Rams and the San Diego Chargers once called Los Angeles their home in the past, and are now looking at the possibility of returning. The Rams may be looking to sell their current site in order to make this move possible, and with their history with the city, it would make a great option for everyone; excluding St. Louis of course. With the California market open for grabs, the concept art for the proposed stadium is looking very good. However, instead of turning this into a battle for the rights, there is an additional location that is perfect for either of these teams, Carson. The market is large enough, and rich enough to play host to two NFL teams, but that is still in the works. Not only are the owners very interested, but the fans that have missed out on hosting a professional football team since 1993 are waiting for the return anxiously. It would be great if a new franchise were to enter into the mix, but seems very unlikely, so the best that can happen is a team relocation.